Can’t start on the above date, fill in contact form at the bottom of this page to let us know about your interest. Each person will work on camera and will have their work screened at the graduation ceremony at The Martial Arts History Museum in Burbank, California. Action for Actors Academy Flyer. Click on the flyer for larger version. Are you prepared for your next action role? Want to be the next action star or be a more marketable actor? 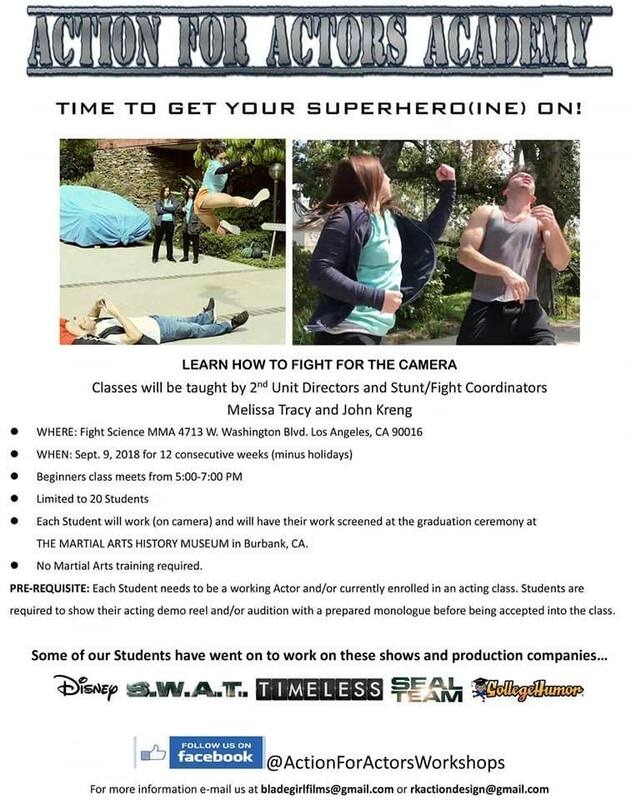 Learn the basics of film fighting in our Action Actors Seminar. Often times a director or producer will assume you already know how to perform action. Don’t come to set unprepared! You can easily get hurt, even if it is a simple stunt! 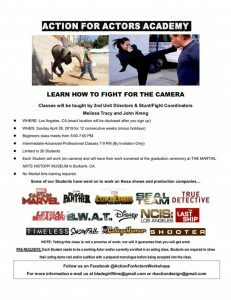 This Action Actors Seminar which teach you what film schools and acting classes do not teach! How to keep yourself, fellow actors, stunt professionals, and the crew safe. The questions to ask to make sure proper insurance is in place. Your rights as a employee in California and how that effects action. What is a stunt as per SAG-AFTRA guidelines. What is expected from you as an Actor when performing Action. What to do if your asked to do a Stunt. Why being 110% honest about your skills will keep you safe and having fun. Working with props, costumes, white-out contact lenses, etc. Knowing the difference between a safe and unsafe set? 1. Why do certain actors make great action stars and some do not … and much more! Where: Los Angeles, CA 90016 (Location will be given upon class sign up). Loose fitting clothes enough to perform physical activities without any restriction. Sweat pants and t-shirt should be fine. Cell phone w/ video capabilities or dedicated video camera. Please make sure your cell phone has extra storage space to record your fight scenes. Students will be video recording one another fight scenes to learn camera awareness and angles, so they can understand and learn what they need to improve on. Before class begins, everyone will be signing a Privacy Agreement. Only footage that everyone in the video agrees on will be allowed to be released. This is important because we want potential employers to see everyone’s best work. We will take a group photo at the end of each training session for those that need to market their training. 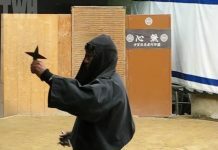 No previous martial arts, fighting, or stage combat experience is required to participate. A certificate of completion will be given out to each participant with perfect attendance. So you can learn the structure of a film fight and important information needed to put together an action film. This is important to know as a filmmaker and performer. A 30 min. private evaluation (to be scheduled between student and instructors). Cash, Credit Cards, and Paypal accepted. No refunds will be given for cancellations or missed classes. Please email rkactiondesign@gmail.com the following information. Absolutely no guests or visitors will be allowed in the class sessions unless previously approved by the instructors. John Kreng the CEO of a LA based Production company, as well as a 2nd Unit Director, Stunt/Fight Coordinator, Action Film Historian, and Author of the textbook “Fight Choreography: The Art of Non- Verbal Dialogue.” As a stunt professional he has worked with Jet Li, Tsui Hark, David Carradine, Steven Spielberg, Roger Corman, Don “The Dragon” Wilson, and Yuen Cheung Yen, to name a few. John has 40+ years experience as a martial artist and 17 years experience as a Stunt/Fight Coordinator. 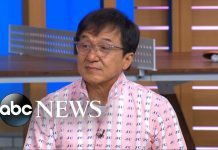 He has been featured in Black Belt, Martial Arts Training, Inside Karate, Karate Review, Impact (UK), Backstage West, and Make Up Artist Magazines. 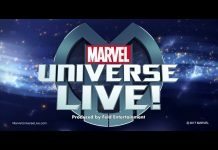 Past clients include The Los Angeles Times, The Weinstein Co., College Humor, SNK, TH-Q, FX Channel, Epix, A&E, Spike, Telemundo, Subaru, TBS, and Telemundo. John was a Producer, Stunt/Fight Coordinator, and one of the lead actors on BATTLE B-BOY. He can be currently seen in Paramount’s THE SCOUTS GUIDE TO THE ZOMBIE APOCALYPSE. Melissa Tracy is an CEO of an Independent production company in Los Angeles. Actress/Action Actress/Writer/Director/Producer/ 2nd Unit director/Fight/Stunt Coordinator. Melissa was seen last week on the big screen at the Chinese Mann Theaters and theaters throughout the US in the feature film Martrys as the creature acting and performing a number of stunts including numerous fight and weapon scenes. As a director and Action/2nd unit director, the projects she has worked on have won awards at the Action on Film Festival and the Buffalo Film Festival and have been featured and shown at Cannes. Melissa’s Action Project Best Projection was distributed in 2006 through Spike TV. Her TV Adventure Series Hook Up is currently in negotiations for 2017 season. Melissa has stunt coordinated a number of films and TV pilots, plus music video for Andrew Lane (Backstreet boys). Melissa has also produced a number of action projects. Melissa has worked as a action actor and stunt professional for over 10 years. She has a background in different martial arts including Savate, Kali, Ninjitsu, JKD, boxing, kickboxing, western and eastern sword play and extensive weapons experience. She has 30 years of dance and acting. Melissa graduated with a BA from California State University Fullerton. 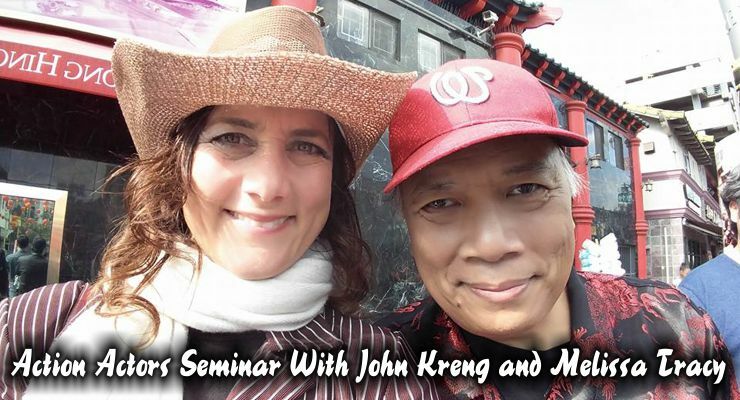 John Kreng has been studying martial arts since 1973 and currently holds third-degree Black Belts in Tang Soo Do and Te Katana Jujitsu. He has taught numerous professional athletes and actors to prepare for their acting roles. John is a very capable instructor and can train individuals for the playing field, the screen or for personal growth. 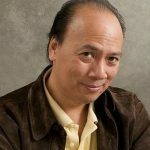 As a stuntman, fight choreographer and/or stunt coordinator, John has worked with Jet Li, Tsui Hark, Steven spielberg, and Yuen Cheung Yen. John's love of martial arts action films has allowed him to contribute to many martial arts and film review magazines and web sites.